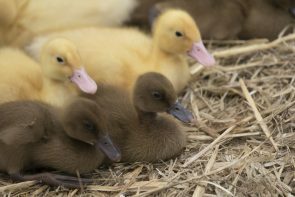 Point of Lay (2018 hatch) ducks for sale @ £18.00 each: 70 x Khaki Campbells and 100 x Cherry Valley ducks available. We no longer sell younger ducklings requiring heat. Please bring along a strong cardboard box/pet carrier to transport your ducks in. The Farm Shop is open daily from 10am to 5pm. Our ducks are hand-fed by visitors to our farm on a daily basis and are, therefore, used to human contact. Our ducks are wormed. Cherry Valley ducks available now. Our ducks come with care instructions or, if you prefer, these can be downloaded from our website.